1. It's warm in there! It's a treat when coach lets us have fans. There was a period where they were not allowed and that was torture! 2. Computrainer- you can't cheat your way through the class! You have to pedal to the watts. There is no hiding! 3. You never know what intervals are going to be in store.. 12 minutes? 36 minutes? 120%? 4. You are ON for a solid 90 minutes! 5. Not to mention..if you're not pedaling to the prescribed cadence..you're going to get barked at by h(authority) aka coach. So.. since being introduced to the pain cave, my threshold for pain has gone way up! Not to mention mental toughness because...well don't you dare get off that bike because you don't feel like you can pedal anymore. Bite your lip and push through! 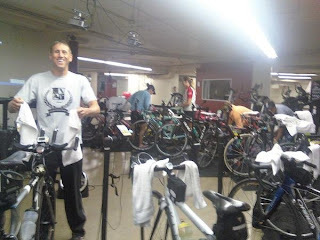 Photo: Pain cave- every Tuesday and Thursday mornings! 30 min warm up + 60 min of pure suffering = 1.5 hours of solid fun! My heart rate hit 181 in class that day- ouch! Speaking of pain threshold..it's time I work on increasing that when it comes to pool workouts! The solution to that may be starting masters classes! Went to the PacWest master swim workout this Sunday and had a great workout. It wasn't as many yards as coach wanted me to put in but I worked hard for the time I was in the pool.. chasing down a guy that was way too fast for our lane! We'll see how that goes! 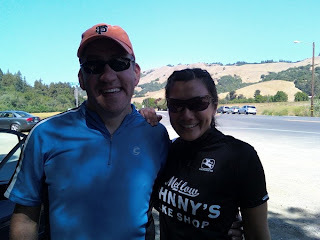 Speaking of Pacwest, joined them for a training ride on Saturday which started from Woodacre out to Marshall Store and back. Solid training ride..minus the junk miles ..nailed my intervals...sunny warm day...awesome! Photo: Ben aka Sanbagger Ben and I after the PacWest ride. A good training week overall! Didn't run much this week because I saw TDR for some muscle soreness on my lower right side. Got beat up on the therapy table.. told coach.. coach took my run sessions out for the next 10 days. What happens when I can't run? I feel much more grateful for being able to the next time I put my running shoes on! Getting back in shape- post Ironman!